MINNEAPOLIS (AP) — Kyrie Irving returned from a one-game absence to help Boston fend off Minnesota, finishing with 23 points, seven rebounds and eight assists to pace the Celtics in a 117-109 victory over the Timberwolves on Thursday night. 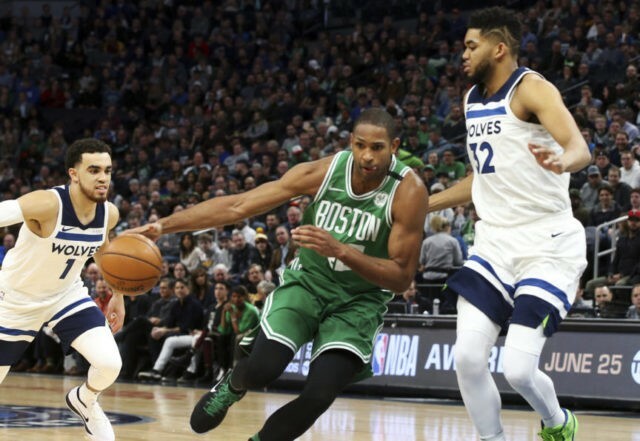 Al Horford added 20 points, eight rebounds, six assists and tough defense on Karl-Anthony Towns for the Celtics, who stayed two games behind Toronto in the Eastern Conference race with their sixth win in seven games. They have three more losses than the Raptors. Nemanja Bjelica scored a career-high 30 points on 11-for-16 shooting, including 6 for 9 from 3-point range. His first 20-10 game in the NBA was ultimately wasted in the third straight loss for the Timberwolves, who are still trying to find their way without injured All-Star Jimmy Butler. They trailed by as many as 18 points soon after halftime, too much to overcome some second-half surges behind Bjelica and 18 points from Taj Gibson on 8-for-10 shooting. The Wolves were within five at 88-83 in the fourth quarter, but every other time they were on the verge of cutting the margin to two possessions Irving and the Celtics had an answer on the other end. Marcus Morris added 17 points for the Celtics, whose victory was tempered a bit by the hard landing Jaylen Brown took on his back after a dunk late in the third quarter. He left with 14 points for evaluation of concussion-like symptoms. Irving, the five-time All-Star whose first season with the Celtics has been stellar save for some minor injuries, was good to go after sitting out at Chicago on Monday to rest a sore left knee that was aggravated in the previous game. The Celtics are only 12-10 in their last 22 games, and Gordon Hayward won’t be walking through the door anytime soon, so Irving’s leadership and production down the stretch and into the playoffs will be critical. Towns finished with 15 points and 11 rebounds, and Jamal Crawford pitched in 15 points off the bench. But Andrew Wiggins went 1 for 8 from 3-point range and 6 for 21 from the floor for a quiet 13 points. The Celtics posted a 35-point first period for the second straight game, as they did to fuel their 105-89 win over the Bulls. Morris helped them pull away with four jumpers in the final 3 1/2 minutes of the frame, one from behind the arc. The Timberwolves produced some passive, sloppy possessions that the Celtics took full advantage of, turning 11 first-half turnovers into 18 points. Towns didn’t score for the Timberwolves for the first 15:22, until a 17-footer from the corner fell through the net, but Morris quickly answered with another 3-pointer. Marcus Smart put together a three-point play soon after and, less than a minute later, converted a one-handed dunk in one violent motion off a rebound of Tatum’s miss to give the Celtics a 51-37 advantage that triggered a timeout by an angry Timberwolves coach Tom Thibodeau. Towns drove and threw down a dunk with 4:26 to go before the break, falling flat on his back after contact at the basket from Aron Baynes, but no foul was called and Towns, who was ejected from the last game for picking up a pair of technical fouls for complaining, took his irritation toward the bench instead of to the referees. The body language was mostly bad all night for the Wolves, who could’ve used that tenacity from Butler as much as ever. Butler’s absence has come at a most difficult time, with the Wolves in the throes of an unrelenting stretch of games. They lost at Portland and Utah on back-to-back nights last week, and they’ve got, gulp, Golden State coming to Target Center on Sunday. The following weekend, the night after a trip to San Antonio, they host Houston. The last game against the Rockets on Feb. 23 was when Butler hurt the meniscus in his right knee. Celtics: Morris hit double digits in points for the seventh time in the last 10 games. … Irving has scored 20 or more points in 45 of 59 games. Timberwolves: Wiggins had his streak of five straight 20-point games end. … Crawford went 1 for 6 from 3-point range and is 1 for 14 over the last three games. Celtics: Host Indiana on Sunday night. They lost 97-91 to the Pacers at home last month. Timberwolves: Host the Warriors on Sunday, the only visit to Minnesota by the defending champions on the schedule for this season.